I’d like to start off with a prediction. If the Australian dollar stays strong against the Euro, the drip of cheap Spanish, French and Italian reds that we are seeing now will turn into a flood. That’s hardly a revelation, but given wines like this are but the tip of the iceberg, I’d expect our wine shop shelves to become even more accented in time. You could argue that said flood is great news for diversity, competition and sheer drinking interest, but I’d remind that Australia rewrote the book on cheap reds many years ago (and hence ignore homegrown reds at your detriment). Anyway, back to this wine. It’s a joven style, lightly oaked Tempranillo packaged extremely well and resplendent in a (much appreciated) screwcap. Imported by Fourth Wave Wine Partners (link above). 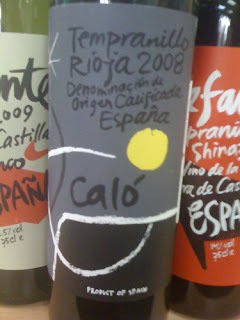 Red with purple edges, the nose here shows herbs, red dirt, stewed red fruit, olives and a flick of mint. The palate is where the action is though, with grainy, sappy tannins one of the best features, holding together the warmish, red earth and red fruit palate very nicely. Much to like with those tannins.